Heroes: cancelled or season four? How the mighty have fallen. NBC’s Heroes was one of the big hits of the 2006-07 season, seemingly ensuring a very long and successful run. But, the series seems to have lost its way and many viewers have complained about confusing or ridiculous storylines. Even worse, many others have just stopped watching altogether. With ratings at an all time low, does the series have a chance at returning for season four? Heroes tells the story of a group of ordinary people who, after a solar eclipse, miraculously develop super powers. They soon learn that that their abilities can be both a blessing and a curse, and that there are many forces trying to either control or destroy them. The large ensemble cast includes Sendhil Ramamurthy, Jack Coleman, Masi Oka, Hayden Panettiere, James Kyson Lee, Milo Ventimiglia, Ali Larter, Adrian Pasdar, Greg Grunberg, Zachary Quinto, Cristine Rose, Ashley Crow, and Noah Gray-Cabey. 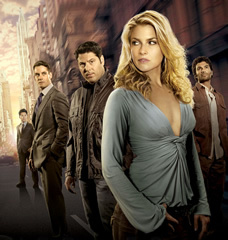 The sci-fi series debuted on September 25, 2006 to 14.3 million viewers and a 5.9/14 rating/share of 18-49 demographic. It was the highest-rated premiere for an NBC drama in five years. Though viewership fell to just 12.57 million in episode two, word of mouth started to kick in. On November 20th, episode nine reached just over 16 million viewers and a 6.9/16. Unfortunately, it went on hiatus a few weeks later. The numbers began to dwindle when it returned in early 2007 and, by May, Heroes hit a series low of 11.14 million and a 5.1/13. Season two started off strong on September 24, 2007 with 14.1 million viewers and a 6.5/15. That didn’t last and viewership began to fall once again. The writers strike caused the season to be shortened so only 11 episodes were made, averaging just 13 million. The honeymoon was certainly beginning to end and the network scrapped its plans to create a spin-off series, Heroes: Origins. Season three has been the show’s most troubled season yet. Heroes returned on September 22, 2008 to 10.09 viewers and the ratings have been falling ever since. The show has been getting hammered by the combination of CBS’ comedy block, ABC’s The Bachelor, and FOX’s 24. Monday’s installment was no exception. It landed in a distant fourth place and attracted 7.04 million and 3.2/7 in the demo. Will the show return for season four? It seems fairly likely. The show is co-produced by Universal Media Studios, part of NBC’s parent company. At the end of season three, they’ll have 60 episodes of the show completed. Ideally, a series needs more than that to be attractive to affiliates in the syndication market, where a production company can make the most money from a show. NBC also has very few hit shows so they aren’t likely to throw Heroes away just yet, especially with its demo numbers. Rest assured though, if Heroes was airing on either CBS or ABC, it surely would have been cancelled awhile ago. Going against Heroes’ future is the fact that times are tough and the show’s not cheap. Because Jay Leno will be filling the five hours of primetime each week, there will be far fewer slots available on the NBC schedule. At this point, it looks like the peacock network will renew Heroes for a shortened season. If ratings keep falling though, they may decide to cut their losses. One way or the other though, it looks like the days of Heroes are certainly numbered. It’s very disappointing not to have a real closure. The least they can do is figure out a way to end it in a decent manner! The actors deserve it! No matter the rating if it was going to be ended They should do it the smart way getting the right writers finishing it in a movie or in a continuation mini series that would really end it. With no more twisted Turns!